The following table shows the revenue of Microsoft from Windows from 2016 to 2018. Sums are in millions. 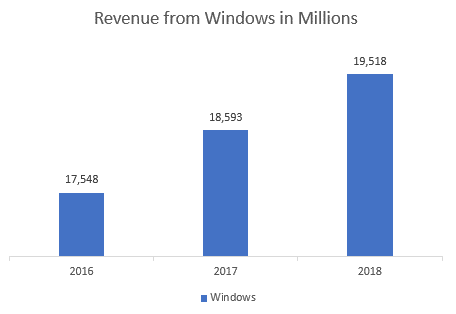 Microsoft’s revenue from Windows grew by $925 million or 5% in 2018 versus the previous year reaching $19.52 Billions versus $18.6 Billions in 2017. Growth in revenue was mainly driven by growth in Windows Commercial and Windows OEM, offset by a decline in patent licensing revenue. Windows Commercial revenue grew 12%, driven by multi-year agreement revenue growth. Windows OEM revenue also saw 5% growth. Windows OEM Pro revenue saw a growth of 11%, ahead of a strengthening commercial PC market. Windows OEM non-Pro revenue saw a 4% decline, below the consumer PC market, due to continued pressure in the entry-level price segment. “Microsoft is a technology company whose mission is to empower every person and every organization on the planet to achieve more (Annual Report, 2018)”. It generates revenue by licensing and supporting a large array of software products; offering a wide range of cloud-based and other services to individuals and business enterprises; designing, manufacturing, and selling devices; and through relevant online advertising to a global audience. Most significant among Microsoft’s expenses are those related to employee compensation; designing, manufacturing, marketing, and sales of products and services; datacenter costs that support its cloud-based services; and income taxes. The most significant product categories which generate the highest part of the company’s revenue are Office products and cloud services, Server products and cloud services, Windows, Gaming, Search advertising, enterprise services, Devices, Linked In and Others. On December 8, 2016, Microsoft completed the acquisition of LinkedIn Corporation for $27.0 billion.